Wow! This is really turning out to be an interesting story. I didn’t see the new plot twists coming at all. I really enjoyed Marcus in the first book, DARKNESS DAWNS, so I’m glad he got top billing in NIGHT REIGNS. Ami is an intriguing heroine who I’ve rooted for from the very beginning. So glad they got their happily ever after. What I find so fascinating about this series is the overall story that is developing throughout all the books. Ms. Duvall gives the reader just enough hints to tantalize, but not enough to solve the puzzles. I’m so curious to see where she takes this series as a whole and the surprises she has in store for the reader. What a great different take on the vampire/immortal genre. A friend recommended DARKNESS DAWNS to me and after reading this book, I must admit that my friends have really great taste! DARKNESS DAWNS was a fast, enjoyable read. The writing was sharp and witty and the dialogue kept me engaged. Although I really enjoyed the main characters, Sarah and Roland, the secondary characters also were engaging. Ms. Duvall left some very interesting questions unanswered, which will ensure that I keep reading this series, but still provided closure and the HEA I long for in a paranormal romance. Strong alpha males, kickass heroines, a sizzling romance, and a happily‐ever‐after ending equal a delicious read! (Click on the image to visit Dianne). So, I raved about ONCE BURNED, the first in the Night Prince series. I went on and on in my review about how fantastic ONCE BURNED was then I read TWICE TEMPTED and Jeaniene Frost exceeded all my expectations. Although I didn’t think it possible, I enjoyed TWICE TEMPTED more than ONCE BURNED. Ms. Frost gives the reader more insight into Vlad and the reasoning why he is so cold to Leila at times. It’s not that he doesn’t love Leila, he’s terrified of loving her too much, losing her, then having to endure the pain of her loss. Leila is just as stubborn and strong‐willed as ever, honing her skills while enduring great highs and lows in her life. Together they make a dynamic, incredible couple. So, I’ve been told that the Night Prince series is a spinoff of Ms. Frost’s extremely popular Night Huntress series. Although I’ve read the first book in the Night Huntress series, in my haste, I also started this series. Because the characters from Night Huntress bleed over into this one, there were a couple of scenes where I missed some backstory as a result of not reading all the Night Huntress books first. However, that minor bump in the road didn’t stop me from immensely enjoying this book…as you can see from my review. You will not be disappointed with these books, no matter where you start! Well, I was totally caught up in this book and turned the page not realizing it was the last one! That’s a good thing and a bad thing. Good because I was so lost within the story, I wasn’t paying attention to the pages. Bad, well, because it just ended! I wouldn’t even say it ended as a cliffhanger. Usually, even with cliffy endings, there’s some sort of resolution within the subplots, but not with DARK WOLF. I was left stranded. Although this ending ensures I’ll continue reading, I just wish there would’ve been a little bit more closure. 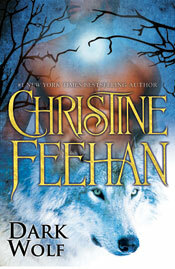 I love Christine Feehan’s Carpathian series. The characters are always so well developed that I can’t help but fall in love with them. The characters in DARK WOLF are no different. My heart went out to Dimitri for the torture he endured. Sky also has had her share of pain, but she’s really proving herself and what she’s capable of achieving. Although I had a little bit of a hard time connecting with Sky because she’s so young in my mind, she’s truly become a remarkable woman. Even with the ending and such a young heroine, I’m definitely glad I read DARK WOLF. Ms. Feehan surely didn’t disappoint. (Click on the image to visit Christine). OMG! I loved ONCE BURNED! The storyline was unique, dialogue witty and filled with humor, and the characters were well developed with flaws and strengths that drew me right into their story. Leila is such an amazing character who has made mistakes in her life and has many challenges to overcome. But instead of hiding from them, she’s willing to face them head‐on. I adore her friendship with her little vampire partner, Marty. Vlad is the original Count Dracula. He’s difficult, arrogant, deadly, arrogant, cruel, and did I mention, arrogant? He’s also passionate, extremely loyal, kind, territorial, considerate, and charming. Yes, he’s a complex person who intrigues me. I flew through this book, sacrificing sleep and laundry! The ending left me wanting, wanting to read the next book. If the first book is any indication of what’s to come, I’m all in!